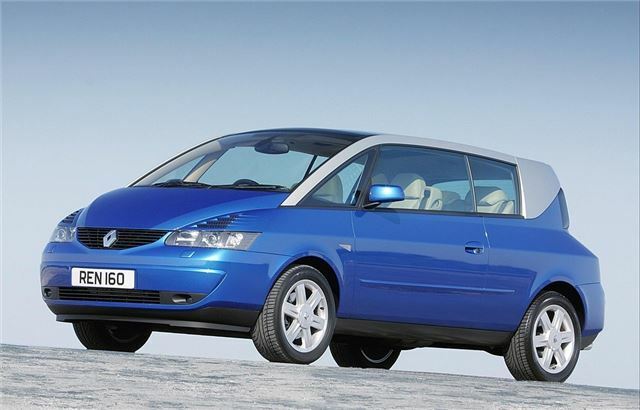 Back in 2002 Renault launched the Avantime on an unsuspecting British public and to mark its 10th anniversary the Avantime Owners Club is holding a special event next month for owners and enthusiasts alike. Avantime is French for 'ahead of time' and the two-door coupe people carrier was certainly that. It was designed to blend comfort, style and performance in an attention-grabbing body. At the time Renault said that they wanted "someone walking around the car to be continually astonished". To this day it remains unique and still looks futuristic. Unfortunately the Avantime was a little too ahead of its time and became a commercial flop. It seems the car buying public weren't ready for a two-door MPV and after just 12 months production was stopped. It remains one of the few concept cars from a mainstream manufacturer that has gone straight into production within a year of first being seen by the public. It had plenty of interesting features including a panoramic glass roof (unheard of at the time) and four windows which could all be lowered by one button. Power came from a 3.0-litre V6 engine with 210bhp combined with a six-speed gearbox, giving the Avantime a top speed of 140mph. A 2.0-litre Turbo engine was also offered. The Avantime is a rare sight on UK roads and has developed a bit of a cult following culminating in the Avantime Owners Club. To celebrate the 10th anniversary, the club will drive its cars to the Transport Museum in Coventry on April 7. The meet starts at 9am and those who pre-register at www.avantime-owners.com will receive a souvenir pack including a hardback copy of a book describing the work of Renault’s former Design Director, Patrick le Quément.